I will continue with the quick breakfast theme. 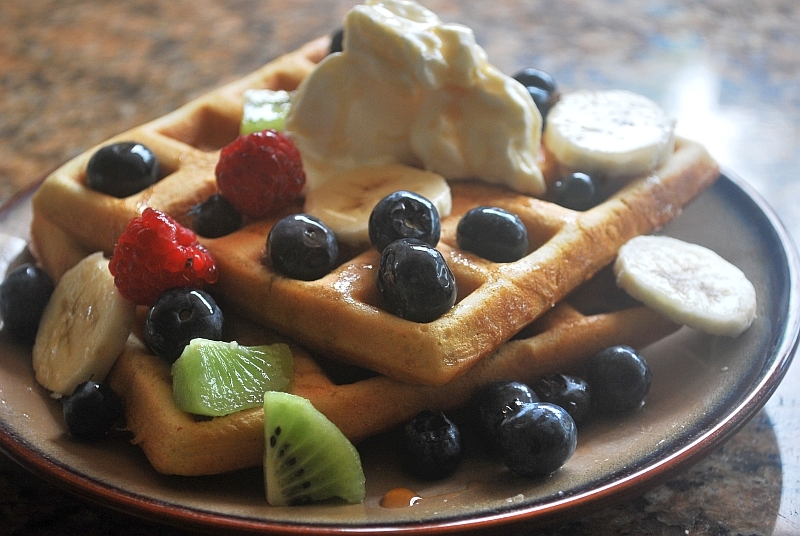 Waffles for me is another idea of a quick, no fuss breakfast best suited for busy mornings. This is because I cook my waffles in advance and freeze them. Then I all have to do in the morning in is simply put them in the toaster straights from the freezer. This make them deliciously warm, crispy on the outside and fluffy in the middle. Just add handful of berries and a drizzle of maple syrup and breakfast is ready! Of course I enjoy them fresh, as a dessert. I can tell you though as a quick, straight from the freezer breakfast they are lifesaver! About three months ago I published a recipe for sourdough pita breads as a method of using an unwanted sourdough starter. This recipe is very similar. I use sourdough starter that normally would be discarded when refreshing my mother. For me this is a win – win scenario. I avoid wasting perfectly good sourdough starter and get yummy waffles as a result. As a result of using sourdough the waffles are extremely light and fluffy. They do not work well when put in stacks. If you are not serving them immediately I suggest cooling them on a wire rack before freezing. Makes about 12 – 14 waffles. 40g sourdough starter (mother) that is normally discarded when you refresh your starter. Here you can find how to make your own starter. About 24 hours before cooking put the starter in a large bowl. Add the water and stir until the starter is dissolved. Add 105g flour and mix well, until all the ingredients are completely combined. Cover with a lid or cling film and leave for about 12 hours at room temperature. After 12 hours the mixture should be well fermented showing little bubbles of air on the surface. Pour in rest of the flour into the bowl, make well in the centre and start adding milk little at the time. Mix with a balloon whisk drawing flour gradually whilst slowly adding the milk. Make sure that all ingredients, including the fermented starter are well mixed into a batter of medium thick consistency. Cover the bowl and place in the fridge for another 12 hours. After another 12 hours remove the bowl from the fridge. Turn on the waffle maker to pre heat. Separate the eggs, reserving whites in a fresh bowl. Add yolks to the mixture, together with olive oil, golden syrup and cinnamon (if using). Whisk all the ingredients together until combined. In a separate bowl beat the egg whites until soft peaks are starting to form. Add the soda bicarbonate and beat until stiff peaks form. Gently fold the beaten egg whites into the mixture. Cook in the waffle maker for 3 – 5 minutes (depending on how hot the waffle irons get). Serve immediately or cool down on a wire rack, place in freezer bags and freeze. To use as a quick breakfast, toast straight from the freezer. 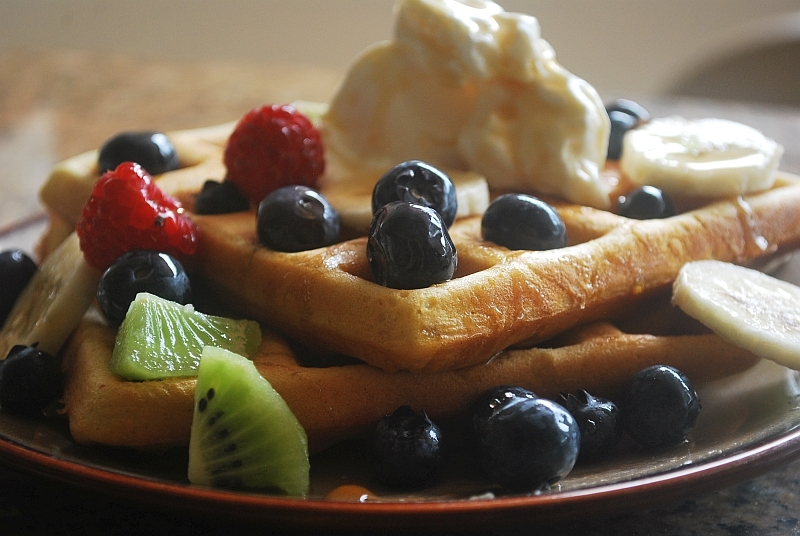 Serve with berries of your choice drizzled with maple syrup.